As a Catholic High School, the spiritual development of young people is of paramount importance. Retreat days allow students to deepen their personal relationship with God and to reflect on how they can apply the Gospel message of Jesus to their daily lives. For each class, one day is set-aside for students to leave campus and participate in a day-long retreat experience. The theme of the retreat day relates to the subject matter of that grade. Time is given for input, personal prayer and community building activities. The freshman retreat day, schedule in the beginning weeks of school, help the class embark on their Ursuline experience as a class. The day begins with a walking journey to the nearby campus of Youngstown State University, Kilcawley Center, for a day of presentations, activities, prayer, reflections, discussions. lunch, and activities to promote class unity. The retreat presenter, Fr. Damien Ference from St. Mary Seminary Cleveland, will facilitate the retreat day. Students walk back to school in the afternoon in time for wrap of the retreat day and dismissal. The sophomore retreat day, “The Face of Christ”, raises students’ awareness of how we encounter Jesus Christ in the “other”; the poor, marginalized, our family members, classmates and in the face of all those in need of our compassion and love. This Gospel Message theme supports the sophomore religion class of New Testament which all students take during second semester. The retreat day, held at nearby Youngstown State University, incorporates music, prayer, activities, lunch, fun and laughter, allowing for the class to build upon the unity they have begun to form in their freshman year. The retreat director, Mr. Ben Walther, Director of Campus Ministry at Walsh University, will help students begin to discern how God is calling them to be the Face of Christ for others in our world. The junior retreat focuses on various social justice issues that students will encounter as part of their Junior religious education course of study, as well as issues that they will encounter in their lives. Some of the topics of the day are: taking care of God’s creation, fair trade, the distribution of power within society and its effects on people from all walks of life and parts of the world, and finally human trafficking which has become an ever increasing problem in the world but more specifically in the United States. Input, discussion and reflection are the major components of the day. The focus of the senior retreat allows the students to reflect on their lives, to look forward to the many decisions they will make in the upcoming months, to repair relationships and to ask forgiveness. It is also a time to deepen their prayer life and experience new forms of praying, to walk the labyrinth with their peers, who are their companions on this journey to adulthood and to express gratitude for all the gifts they have been given. It is also a time to look inward and decide the type of adult they wish to become. Altar Servers sign up in August through their Religion class to assist at Masses. Although past experience is appreciated, interested students need not be altar servers in their Catholic parish. Training is provided to anyone new to this ministry. Both young women and men may be trained as altar servers. Seniors are invited to participate in the special role of Eucharistic Minister. Eucharistic Ministers provide extensive training after school and are commissioned to serve during our Feast of St. Ursula Liturgy. 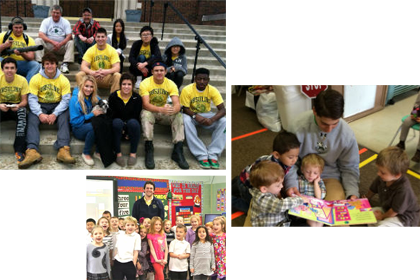 Once commissioned as Eucharistic Ministers, students may also serve in their home parish. Readers take on the important ministry of proclaiming the Word of God and Petitions at all-school Masses and Prayer Services. Students interested in becoming a lector should sign up on the Liturgical Ministry Survey distributed through all religion classes in the fall of the academic year. Readers meet on the day of Mass to rehearse the selected readings. The Liturgical Choir, El Fuego, is open to all interested students. El Fuego, Spanish for “The Fire,” brings music and song to all Ursuline worship experiences. El Fuego is open to vocalists and musicians. The choir meets to practice after school on Mondays in the Band Room. Practice is also held on the day of the liturgy during period three. Occasionally, El Fuego is asked to sing for Diocesan Masses and community events. Dr. Linda Miller, Religion teacher and Liturgy Coordinator, directs the choir with periodic assistance from Mrs. Joan Williams of the Fine Arts Department. The Liturgy Committee, made up of all student volunteers under the guidance of Dr. Linda Miller, meets after school to plan school Masses and Prayer Services. Members of the Liturgy Committee support our worship experience with their creativity and leadership. Students interested in joining the Liturgy Committee may sign up on the Liturgical Survey in August through their religion class. Students are invited to assist as sacristans or readers at morning mass in the Rev. Daniel Venglarik Chapel where Fr. Murphy presides. For more information on how students may become involved in liturgical ministries, contact Dr. Linda Miller (lmilleruhs@youngstowndiocese.org). 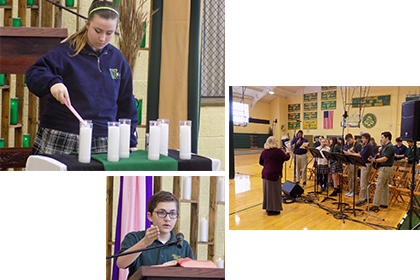 All liturgies or prayer services begin at 10:00 in the Ursuline gym unless otherwise noted. 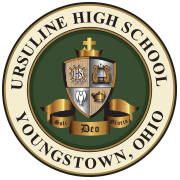 All students, parents, alumni, and friends of Ursuline are invited to attend Morning Liturgy on Tuesdays and Thursdays at 7:20 AM in the Father Daniel M. Venglarik Chapel.